Pillar 5: The Marketing & Promotion. These are things you really can’t go around them in order to succeed. I’ll walk you through each one. I’ll give you examples where applicable and I’ll even share with you links to find out more on a particular pillar if you like. Keep it simple – Everything related building your dream business is simple. Somethings may not be easy to do but they are still simple. Have Patience – No one Build anything worthwhile in a day. It takes time to get there but once you do you’ll have the recipe and you’ll never look back. Don’t be Scared – It’s ok to make mistakes. That’s how we learn. They Key is to learn from them and move on. Don’t Dwell in your past or on unpleasantries! – This would be time wasted and time is your most valuable asset and one you CANNOT control. If you waste it you never get that itme back. Do you really want to live in your past? Acknowledge the things that bothered you, learn from them and move on! Never Fail – Failing is not an Option. Just Remove it from your Dictionary please (Don’t Confuse Failing with Making Mistakes. The latter is ok). If at first you don’t succeed, change the variables and try again. No Negativity – Yes you cannot be positive 100% of the time. But you should not be negative either. Set Goals – This is where I am coming from, This is where I am now, This is where I want to Go. Set SMART Goals. Be Intuitive – Learn to trust your instincts. They are usually right. Prioritize – Put an E (for Eliminate) on all activities, like watching TV for hours and hours, that don’t move you closer towards your goals. Ask yourself, what would someone who is already where I want to be do with his/her time now? Now as you will probably find out by reading this blog a bit more, I am a HUGE believer in Bootstrapping business costs. “Pull yourself up by the bootstraps” is the saying… The metaphor here is interesting as it really means elevate yourself under your own effort. In other words it is better to pull yourself up by using your own time and energy than using leverage. Make Your first dollars or dollar online first, then look to expand. Sell to one customer then try to sell to another one step at a time. See what is working and what’s not. Adjust and try again. Do you know how do you eat an elephant? One bite at a time (by the way, I hope you realize that this is a metaphor and I have no intention of, nor I suggest you, trying eating a poor elephant lol). And Once you got proof-of-concept that what you have to offer is of interest to people and they buy it, then It is time to go big and expand. As then you’ll have discovered the recipe to success so to speak and all you have to do is “rinse & repeat”. 80% of what we try won’t work. 20% of what we do accounts for 80% of the results we get and so on. Stated here, this means that most things (80%) that I try are not going to work out as I wanted them to (short term). However, if I keep applying my mind, my effort, my expertise, my imagination and keep growing myself over the long term and I persistently and consistently applying what I learn from my mistakes, mixing it around in new ways and avoiding instant gratification, I know I will succeed. In other words, using this mindset gives you permission to change your approach if that doesn’t work for you. When you work for someone else you are working within a Business. However, Running your own business is a different thing and requires a differnt “game plan” and approach. This is not the least because the responsibilities are different. And it requires a different mindset. It’s about creating value and getting results. Don’t expect the same environment as if you were working in a business. Business Mindset #5 – You & I Get Paid For The Value We Create FOR OTHER PEOPLE. When you have your own business, you are typically offering products and/or services. However, you are not really selling product name X or Service Y. You are actually selling the value your customers get from using/getting your product X or service Y. You get paid proportianally to the value others get and not how long it took you to create a product or learn to perform a service. The world doesn’t care if it took me 1 month to set up this site. They only care if they can take value from accessing my site. This is very important mindset to have and it will also save you time and furstration. It is not about (just) the work but it is about the value to others. Please note I am not saying that there is no correlation to the amount of work we put in and the success we get. But do you really care how long it took me to write up this post? You (should only) care if you can take somehting useful out of it. Business Mindset #6 – I am not trying to (just) make Money. I am cracking the code. Don’t focus on making money in your business. It may come as a sock as most people get/are in business to make money. “I’ve got bills to pay…” etc. What I am saying is that if you don’t get in the mindset that the business is there to make something out of it in the long term, build a better future, (ie because you may be saying that I need money now not in 5 years), you won’t succeed in the long term. And if you don’t endure a short term pain to secure a better long term future, the 5 years will come and go and you’ll still be in the situation you were before you start. Instead, focus to Crack the code by trying to figure out what your customers want, how they want it and what it does for them. Then Build it, Market it and Sell it to them in a way that makes it very attractive to them. Then build a System that does this (almost automatically) and inverst your time, effort and energy making the system better and tuning the engine. This will ultimately create an asset that grows and have value in it self. It becomes part of your winning portfolio. This leads to a profitable business. Remember This: The minute you stop chasing money and Focus on providing value to others, money will be drawn to you. Smaller Niches (usually sub-niches of a bigger one) like instead of going after the whole musical instruments market, we select the Piano sub niche or how-to markets or DIY etc. There are 4 generic steps you usually need to go about in selecting your market so you can position yourself into it (as a marketer). Is it Great in Numbers? in other words if you do a search on the main keyword(s) like piano do you get hundreds of thousand results? – extra tip: You can use Google Keyword tool (free) to search the volume for a market based on main keyword(s). Once you have identified the market, as your chosen one to position yourself, you need to start getting to know your ideal prospects and future customers, so you can strategically design your Offers and provide Results-in-Advance for them as discussed in previous posts. So they can eventually turn from propsects into customers and buy your product(s). What Products they offer reviews? Who is Selling these products? What “Language” are they using? We do the above to help us answering the next set of questions as accurately as possible. Please note that it is OK to start and learn more about your prospects later on but the more accurately you can answer the following questions the more successful your marketing will be (on that market and hence your sales :)). What is their Surface/End Means desire? What is their end goal? What are they Used to? 1- The surface desire would most likely be to make money. However, the core desire/end goal could be for them to able to spend more time with family, do what they like and love, quit the 9-5 job or just taking care of family :). To help me further, I’d Use a question like “if I could just make/have/do….” and fill in the rest of the sentence thinking as my prospect or myself, if I were to buy something in that market. If I could just make $20k / month, I could quit my job and spend more time with my two kids and family. I’d spend more time with friends and would do only things that I love and which my current work commitments don’t allow me. 2- They may want to learn today, about building a website or how to use an Auto-responder or even How they can start in the MMO/IM market. 3- They may be afraid of that they may waste (yet again) more money on another magic one-push makes you rich software that promises the world and delivers none. Or they may be afraid of what their friends and family may say if they don’t succeed at first and/or make a bad investment decision etc. Overall I’d try to Identify the emotional benefit. That is, Identify the key offerings of that market in consideration and keep asking “What is the benefit of that offering? and What is the benefit of that benefit etc until I reach to an answer that is similar to “it just feels good” or no more benefits can be found. We need to really visualize and get to know our ideal prospects for our chosen market(s). What you will realize at some point and this is especially true in the Information Products market, is that not all traffic is of equal quality. Therefore not all your prospects will be either. Please note: When I say quality, that is meant purely from the point of view on how likely a prospect is to be marketed and purchase something from you. I am not referring to their quality as persons, of-course. by the source of traffic; that is Traffic from syndication, Joint Ventures/Endorsed, Search Engine, Pay per click, social media traffic and so on. And that’s it. I hope these provide a good basis for you to select your market if you haven’t found it already or if you have, you can use these to validate your assumptions. The 2nd Pillar to any successful online business is about the offer. What we can offer to our market that will be of value to them and because of that we will get rewarded. As with Pillar no 1, let us steer us right by asking some important questions that if answered will lead us to offer our market the “right” offer. Just remember we are not trying to offer everything to everyone. So the 1st thing I’d try is to identify what would be the core problem (of the market identified in pillar no 1 above) by keep asking why/what else could be the problem apart the obvious one. And I’d do that until 5 or deeper problems have been uncovered. Tip: You can do the same by visiting your market’s biggest forum. Spend some time reading what the members say,complain, state or wish about. What is the Prospects’ biggest problem in the Information Market? They don’t know where to start/ Don’t have the time required or technical know-how. They have an overall disbelief about everyone – They have spent money on X product, tried for a few days or not at all. Didn’t work or it was too difficult to make it work. So they may have given up. They fear of failure and what others (like family or friends) may think of them… And so on. So If I were to target this market I’d use all the above in my offer and would continue to use the above in my engagement with my prospects and clients; in emails, sales pages, etc etc. So What Can/Could You Do To Help Your Prospects Now? The idea here is that we want to provide our prospects with Results-in-Advance. Ideally 4-5 things that help them solve the problems identified above, for FREE. So 1st, You need to ask, what is the greatest thing I can give my subscribers/prospects NOW, which will provide results in advance for them and I can provide it for free? Identifying that will help you move forward by heaps and can be the first free thing out of four you offer to your prospects, in order for them to engage with you. First, what I’d need to ensure is that what ever product we get is a) of value and b) comes with either Private Label Rights or Master Resell Rights license. Because it’s Expensive to Make a Product From Scratch. Whereas if we get a PLR/MRR product these usually come complete with Done-For-You in most cases sales pages et al. And we’d need at least 1 of those, if we just want to sell someone’s elses’ product as affiliate or 2+ if we’re to sell our own products. At a minimum we’d need One To Give away and One to Sell. You may be wondering why we need to give away one product for free. That’s because successful online businesses use what Called The Free-to-Paid Model to get cold prospects to warm and eventually clients. This model is Strongly Focused on Building a LIST & using Email Marketing for ascending prospects into buyers. It works by giving out, to interested people, something of value for free, in exchange for that someone becoming our subscriber or our prospect if you like. We can then monetize these Prospects and Through a UNIQUELY Accelerated Process (BTW – I walk you through this process in my case study/workshop video which you can request and watch for free here), we Make Them Our Clients! How/Where to Find These Products? The first thing to remember is that we want offers/products that are as much as possible Evergreen. That is they are always relevant and in demand and not (for example seasonal unless that’s your market of-course). …trying to get customers online or Traditional Make Money Online (like home study courses on how to make money online or list building courses and so on). Alternatively, If you don’t want to get your own products, you could find and offer someone elses’ using Affiliate Marketing. The magic so to speak happens in what we call a Sales Funnel. A sales funnel in simplicity is a series of web pages interconnected together on a specific sequence to accomplish a specific set of goals e.g. Convert a prospect that knows nothing about us or our business to a (hopefully raving) client. A common and simple sales funnel consists of a Landing Page (aka squeeze page), a Sales Page (some times also called a One-Time-Offer page) and a Thank You Page, which is the page your customers get what they purchased basically. The squeeze page is the entrance to your sales funnel. So it plays a vital role in the whole sales process as you can imagine. The purpose of it is to turn cold visitors into prospects that want to hear from you. As they don’t know us we need to offer them something to entice them to get into our sales funnel. If you recall we are using the Free-To-Paid model which states that we need to give something for free at first. Therefore, the goal of the squeeze page is to get as many of the visitors of that entrance page to become our subscribers. The Headline “Get The Official Facebook …” which needs to state what it’s being offered as well as the benefit for the visitor to get this. The sales page is the one our now prospects (as they will have opted-in to get what we offered for free in the squeeze page and thus are no longer “cold” type prospects) will see as the next page in our sales process/funnel. The goal of this page should be clear and it’s to monetize our newly gained prospects/subscribers with an offer that is of value to them and at a bargain price (hence why we call it One-Time-Offer). Note this doesn’t mean we’ll make profit from sales at this stage. The 3-part Headline and Lead which first draws attention to them by asking them to pay attention e.g. “Stop before you do anything else …” The 2nd part that acknowledges their previous step e.g. “thanks for subscribing” in small text in black on the top the image. The main headline of what is being offered with a clear CTA e.g. “special One-Tine-Offer: GET …” and last but not least, the lead which states the benefit (to our potential customers) they will get if they buy our product. The other truly important thing to note while not stated on the page itself, is that offer being made is related to the free offer we promised in the squeeze page to make them become our subscribers. 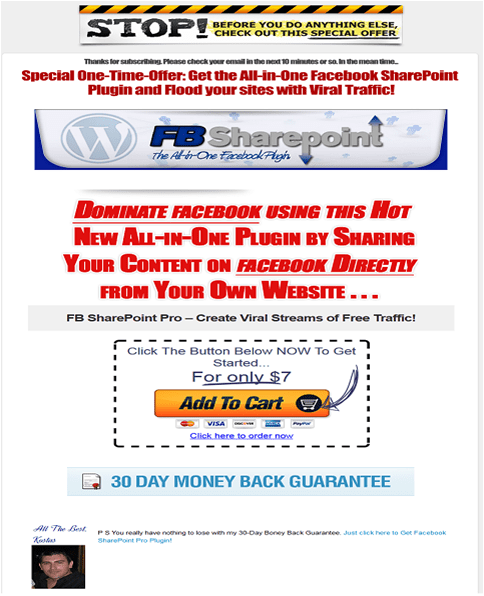 If you recall we offered a manual and a Facebook plugin for free. This now paid offer is about a Facebook related tool. This is very important and again a lot of businesses get this wrong. Also the big CTA towards the end of the page which states the price and what we want them to do (e.g. 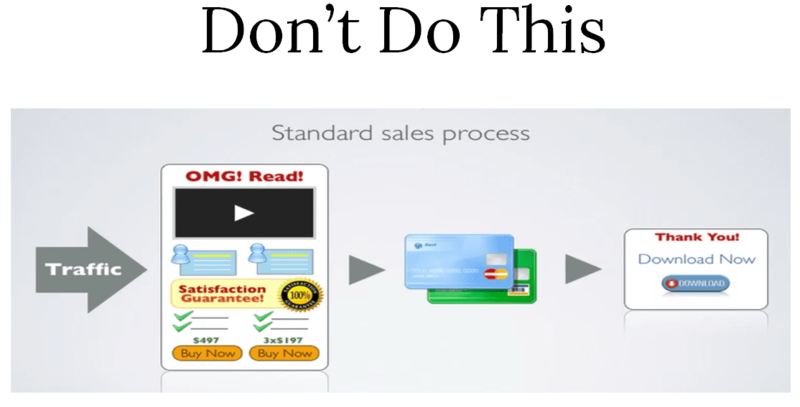 Add to Cart) as well as the 30-days guarantee are both of great importance to any sales page. Last but not least, the price of this offer itself should be of interest. Again don’t worry about what’s being offered but the price is set so it gets us the maximum sales. We can’t really ask someone just joined us that haven’t heard us before to buy something that we may sell for $2000. It will be close to impossible to have any conversions. What we want is to help our prospects get to know us and trust us first by asking them for a small commitment first. …For free in our squeeze page and what they bought in our sales page. Note that for physical products this page can be an acknowledgment of their order etc. Again I am using an example of a thank you page from my information business. The acknowledgement of their previous taken action e.g. “thanks for signing up” (as this page is the download page for something offered for free) and what they can expect now that they have signed up. The clear instructions of what they need to do e.g. “Download Your …”. Last but not least, the taking advantage of the Thank you Page “real estate” to offering something else (called Integration or cross Marketing). The idea here is that a prospect (or a buyer if this was a thank you page for something purchased) is in a “trusting mode” and could be easier to offer something more for them to get whether this is another free offer or something to buy. Amazon does this Cross-promotion very good with their “Other customers bought these with the thing you just bought” statements after you add something to cart and/or purchase from Amazon. And that’s it for our simple sales process funnel pages. Obviously these are the minimum pages required and there can be more of them. But in keeping it simple, these are the ones you will need as a minimum. In order to set your sales funnel pages up you will need a few key tools at a minimum. Some of them like the hosting, domain and others you could by pass completely if you use a page service provider like Leadpages.net or Clickfunnels.com. To Register a Domain Name. I use Namecheap.com ~ $10/Year for a .com domain. Web Hosting – Stay away from free. I’ve used Hostgator ~ It’s about $10/Month for a starter package with a database (for WordPress). But Pick Any (non-free) really. It doesn’t matter that much as long as you can install WordPress on it. You could use a page service provider like Leadpages.net which is especially good for setting up squeeze pages as it has a very easy drag and drop page builder. An Autoresponder Service Provider. I like and use AWeber (for its reliability & Deliverability). You can start with just $1 USD Trial for 1st Month (the often do completely no-cost trial promotions as well) then $19/Month (cost increases per subscriber volume). Or use Get Response (similar to Aweber – not as good in the deliverability of emails – I use this too personally). Usually Free for your first 250 subscribers. Costs a bit less than Aweber. You can also try the (more) free ones like Mailchimp if you like. We know know our market, have identified a valuable offer suitable for that market and have a simple sales process in place. In traditional brick & mortar businesses the location of the business establishment often plays a critical role to its business success. There is the saying that applies to those type of businesses that states something like “if you build it they (the customers) will come”. This most certainly does not apply with online businesses. So what do we do to get customers? The temptation that exists for online business would be to try to get customers immediately, as opposed to generate leads first for their business. The problem with the former is that even for a typically good product, the conversion would be like 2%. That means that if we buy traffic and send 100 people to see our product, only 2 of those will become clients on average. The other 98 of them would be gone forever. This is not a clever way to build a customer list and thus build a business. So the number one goal for any online business, at this stage, is to build a list of qualified prospects. …Which, if you recall, states that we give visitors of our landing page, that don’t usually know about our business, something for free in exchange for their name (optionally) and email address. And thus we make them our prospects. The List Of Prospects we Build Are ours So we can follow up with them (via the process of Email Marketing) and ascend them to clients. We can build as a big list of prospects as we can really. Prospects or leads are the lifeblood of your business. This step is where most people get it wrong. They Actually Send “Cold” – as in people who don’t know you – Traffic Straight To a Sales Page trying to get customers as opposed to building a list of prospects and then ascend these into clients! Sending Cold Traffic Straight To A Sales Page Means We Are NOT Building Our Prospects List, So We Can Provide Value and Get Rewarded For It Again and Again! There are lots of traffic types that we can use to generate leads and clients for our business. However, not all traffic is created equally. Meaning that different sources are suitable for certain types of businesses but not for others. Traffic Methods like Google SEO or Facebook Free Traffic and Article Marketing should be avoided when you want to build a profitable business. This is because while the sound of free is great, they are too slow or end up being more expensive than paid traffic (in terms of time etc). When we want to test something quick out e.g. 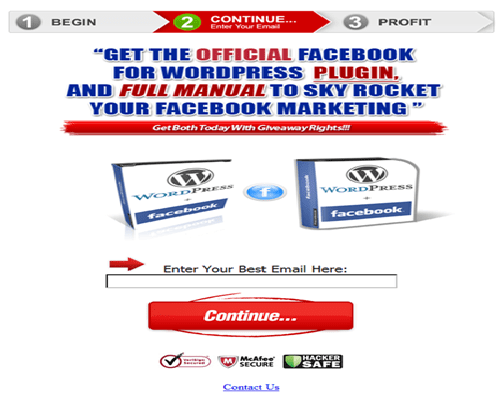 how it converts or build a list of prospects quick we use Solo Ads Traffic. This like Pay Per Click (PPC) traffic that costs anywhere from $0.30-$0.80+ per click aka unique visitor to our landing page. We use a site called Udimi.com because they offer a feedback system which means that we can get quality traffic and have a way to get back to a seller if they don’t deliver. Basically, we pay someone with a list of prospects in the same market as we are (e.g. The Information Solutions niche) to email their subscribers about our Free & Valuable offer, using our swipe (called ad) for an agreed number of unique clicks (e.g. 100+). Think of clicks as 1 click being someone visiting our squeeze page to see what we offer. This type of traffic is truly the fastest method to build a list of prospects. Furthermore, if we already have a list of prospects in the market of interest, we use a free type of traffic that is similar to Solo Ads called Ad Swaps. The way Ad Swaps work is that we agree with someone to email each other offers’ to our lists for an agreed number of clicks (e.g. 50-100 or more). Since we email our list of prospects with our partners’ free offer and they do the same for us, there is no cost associated with this. Obviously, to use this type of traffic you need to already have a list of prospects. As a second source for lead generation we also use Facebook Ads which another form of PPC. It works great and the targeting options are second to none. These days you can target any market you can think of with FB Ads. We also use FB Ads to do re-marketing which is a form of targeted ad to people that have seen our offers (free or paid) but for any reason did not take action the 1st time. We have a chance to show them our offer again through re-marketing (also called retargeting Ads). Last but not least, and depending on the niche we work, we also use Google Ads PPC. They work similarly with FB Ads PPC but we have found that they are better for certain markets and not that good for others. This is not the case for FB Ads which at least for now work great for any niche. If you’d like a detailed Traffic plan that I use in our businesses, ensure you watch my case study/workshop video HERE. 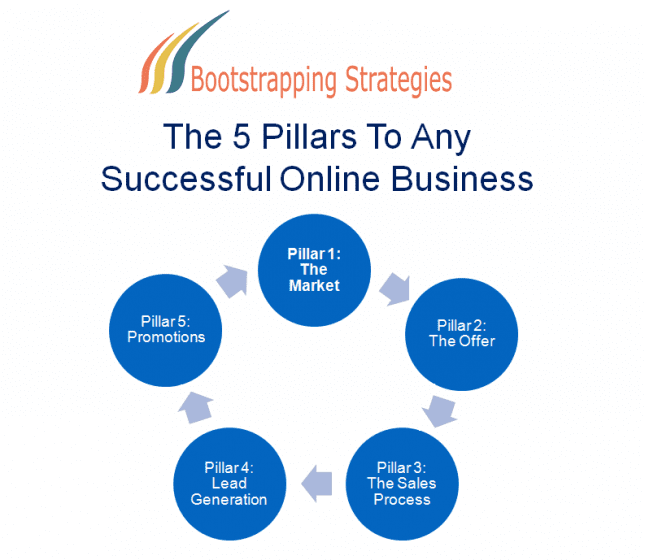 In the last pillar to Any Successful Online Business we basically reap the rewards of our efforts in the previous pillars. At this stage, you will have built and keep building a list of qualified prospects for your business and you will have some customers as well. The information in this pillar is about how to ascend those qualified prospects into repeat buyers and thus make them our clients. While the main goal initially is to continuously generating leads for our business, we must not forget the existed prospects already in our list. As the profits for our business will mainly come from existing prospects that know and trust us via a set of back end offers and promotions. The easiest and quickest way to promote to existing prospects and customers is via the art of email marketing. Hint: remember there is also the Re-Marketing method through the use of PPC ads from Facebook and/or Google etc. You can email your list of prospects any time you have a special promotion running, when you have a new product or service, when you want to cross-promote other businesses’ products and so on. And the temptation would be to do just the above as these are the promotions that will get you money. However, you should not treat your list of prospects and current buyers as an ATM machine even though as discussed the temptation is there. You Need to Provide Value To your List. Not just bombard them with Promotions and asking them to buy your products/services or others’. If you don’t, they will lose interest to you and THEY WILL move on. If that happens even if you have thousands of prospects in your list, they will worth very little to you! We need to find a balance in terms of promoting offers to our list of prospects and providing value. Ideally you’d want to achieve both! What we do is aiming to provide a pure knowledge piece of content at least once per week where no promotion takes place (at least not a direct one). And we promote our own services and products and occasionally partners’ offers when we think it will add value to them and these will enhance their initial interest. We do that by segmenting our list of prospects based on an interest they’ve shown. For example, if they read a post on Facebook marketing that tells us that currently they are interested in that activity. So they are automatically being “tagged” by the systems we use for that interest. So the next time we have an offer that is related to FB marketing, we’ll email them about it BUT NOT prospects who are not tagged for that interest. This is enables us to email for offers more often to our prospects but not all prospects will get the email for all offers and thus won’t get the feeling of being “bombarded” by us. This is what savvy entrepreneurs do and you can do this too if you only want to build just one business! if you’re not familiar with bootstrapping, this is basically a strategy where you aim to spend the absolute minimum that can get you a return and once it does, you re-invest those returns into the progressive development of the business. This imply makes, at least when you’re starting out a business, the goal that the business funds itself! While this may sound easier than doing it, if you incorporate and master what I call a few key “bootstrapping strategies” into your business then you’ll never be out of one! Have questions or comments? Let’s talk about them below. If you have any “Pillar” specific tips that you think we missed, please share it in the comments below.